I say it every season, round about the time I walk out of the Desigual runway show at New York Fashion Week: what good is fashion if it doesn’t make you happy? 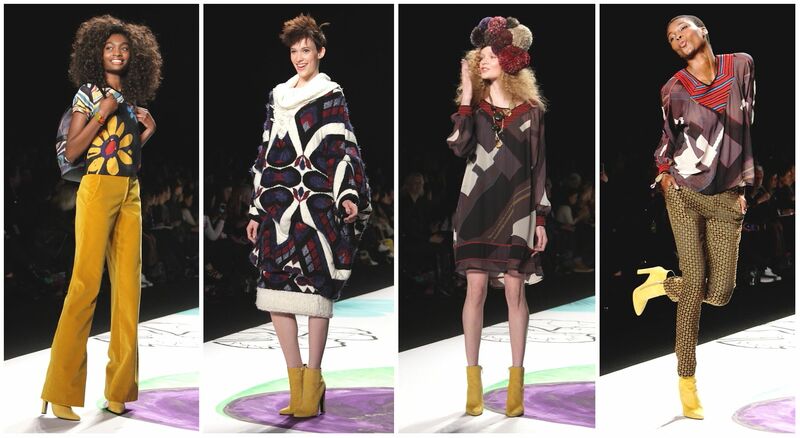 And, above all else, Desigual is the happiest line on earth. It helps, of course, that the clothes are beautiful, wearable and lots and lots of fun. The inspiration for Fall/Winter 2015 came from many, many places, pretty much all around the world and from the company’s collaboration with Christian Lacroix. 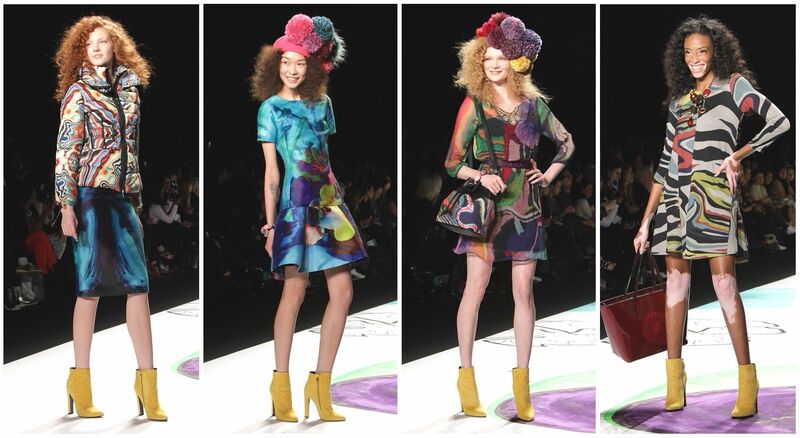 According to Desigual’s notes, “an abstract painting, a swatch of upholstery, a photographer in a book about Africa, a historic trip through Renaissance Northern Europe and a flush landscape of flowers” were the jumping off points for this colorful, joyous collection. It started with a big, embroidered folk-print overcoat, then moved to what the design company’s most noted for, dresses, skirts, pants and tops in tribal-inspired prints and Nordic-inspired geometrics. 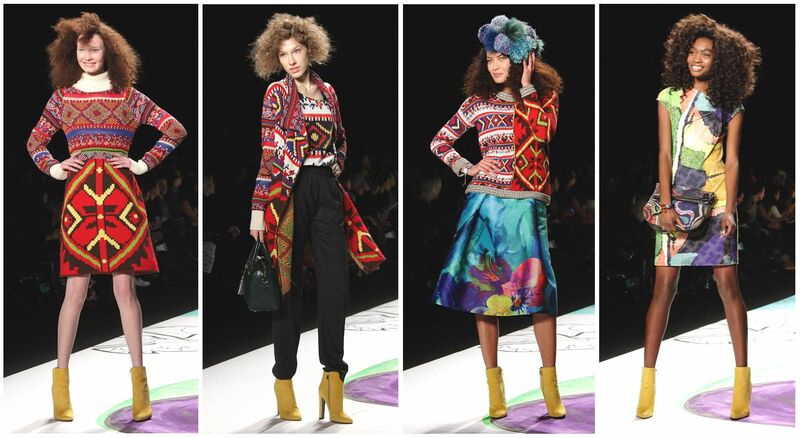 Bold florals and patterns, as always, bring a touch of summer color to the Fall, all in comfortable, wearable designs. There are plenty of their classic shift dresses, the perfect go-to in any season when you want to feel bright, cheery and pretty. They’re joined by long-sleeved, turtle-neck knits, cozy sweaters, big, comfy pants and a fantastic collection of outerwear. 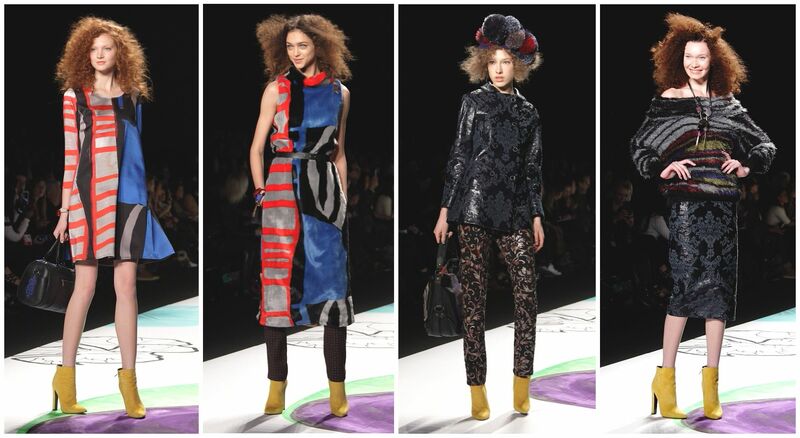 Of course what makes it special are Desigual’s designers and their collective eye for pattern and texture. I have never hidden my love for Desigual, the pure joy I feel when I wear it or the excitement, every season, of being invited to its runway show. And it never hurts to pull out the brights in the darkest part of winter. La Vida es chula, every day with Desigual. This entry was posted in Fashion and tagged Anton Brookes, Debora Fougere, Desigual, fashion, fashion week, MBFW, mercedes benz fashion week, New York, New York Fashion Week, Red Stiletto Media, runway. Bookmark the permalink.